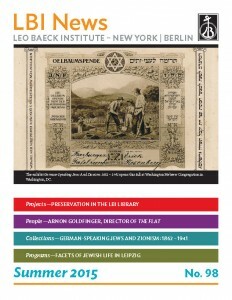 On March 1, 2015, as LBI opened a symposium and exhibit on the 19TH-century German movement that launched the academic study of Judaism, it honored a scholar who exemplifies the movement’s ideals in the 21ST century. 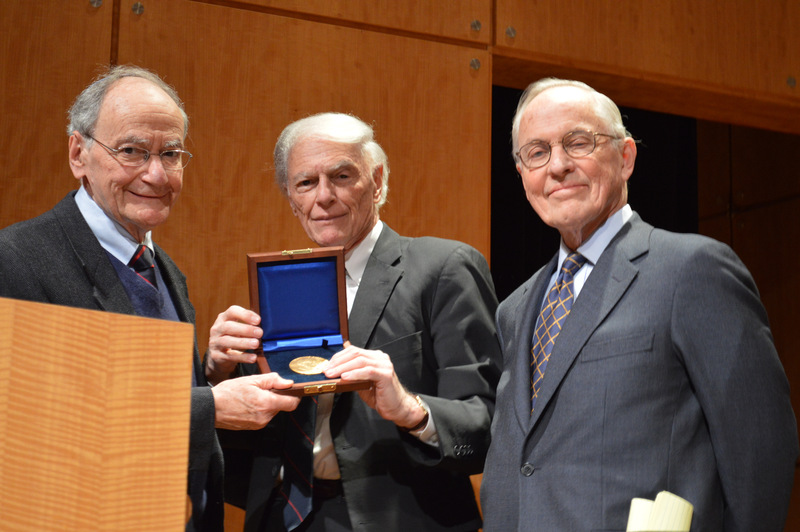 Professor Ismar Schorsch was presented with the Leo Baeck Medal for his scholarly work as well as his legacy as a former President of Leo Baeck Institute and Chancellor of Jewish Theological Seminary (JTS). 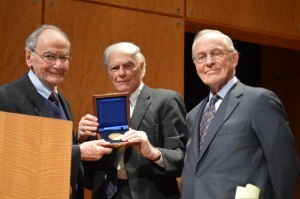 Leo Baeck Institute Trustee Robert Rifkind and President Dr. Ronald B. Sobel presented him with the award. Schorsch played a dual role at the event; after he accepted the award, he gave a brief lecture to launch the symposium on the Wissenschaft des Judentums movement and its role in shaping Jewish identity. He has published widely on the Wissenschaft, including an anthology of the historical writings of Heinrich Graetz and articles on Moritz Steinschneider, Leopold Zunz, and others. In his remarks, Rifkind noted that Schorsch’s leadership of Jewish institutions also embodied Wissenschaft ideals. During his almost 20-year tenure at JTS, Rifkind said, “the seminary blossomed, its endowment doubled, its faculty grew, and its student body was enlarged.” Schorsch was the driving force behind the creation of the Schechter Institute of Jewish Studies in Jerusalem, which introduced new leadership and religious alternatives in Israel. He also presided over the creation of Project Judaica, a Jewish studies program with the Russian State University for the Humanities in Moscow, which trains accredited specialists in Jewish History within Russian higher education and cultivates the future leaders of Russian-Jewish life. In 1996, JTS established the William Davidson Graduate School to train Jewish educators in the US. All of these achievements clearly reflect Schorsch’s core belief that serious Jewish education is the cornerstone of the Jewish people’s survival. Rifkind also lauded Schorsch’s leadership of LBI during his 18-year tenure as its president. It was under Schorsch’s presidency that the Institute moved from its first home on 73RD street and entered into the partnership that created the Center for Jewish History.